That looks like an interesting group of peas. I never start my peas indoors like you do. I do soak them some years to speed up the process - like this year when everything is so late. I hope it gets them off to a good start. I calculated that I would be planted almost 200 peas Even if I did half of that (which assumes that my way loses half the pea seed). 100 peas would be a lot to start. That would be alot to start indoors. I started 40 peas. The rootrainer's are really deep so I plant 2 per cell. 3 flats would start 192 peas at 2 per cell. I have to start them indoors or the squirrels would eat all the seed. Wow, beans this early? Interesting. I swore you were colder than me. The first year I planted snow, snap and shelling peas in the same bed. I couldn't tell them apart when they grew together. Now I only grow one variety, and yes, it's a snap for the same reasons you gave. Intersting that you plant them indoors? I have always direct sowed them (did last weekend). I'm very curious to see if they do well for you. I'd love to plant mine inside. Oh, and my fridge is constantly in use in late winter, early spring. ROFL Just don't open the fridge and drop a tray on the ground. I was cleaning up dirt from the fridge forever! So, how do you like the root trainers? I've thought about getting some. I start mine in long paper pots and they take right off when I plant them paper and all. I sure like the looks of the trainers though! I'm growing snap peas for the first time, and melting sugar snow peas, which I grew last year and loved. Lovely iris - I'm very fond of iris! I loved the peas I did get last year, but they took up so much space for so little that I wonder if I'll do them again. Makes you wonder how commercial farmers do it! Tessa - This is the second year I used the rootrainers and I have no complaints. Really durable and they growing nice peas & beans. Getting the peas underway is a definite sign that spring is here (or almost here!) and that iris is not a bad announcer of spring either! So pretty. I am considering starting my pole beans and sugar snap peas inside this year. The ground is so soggy and cold this spring that if I wait for it to warm up enough to germinate the seed properly, I am likely going to be two weeks behind nornal planting times. What lovely spring-y photos on a such a nice spring-y day! 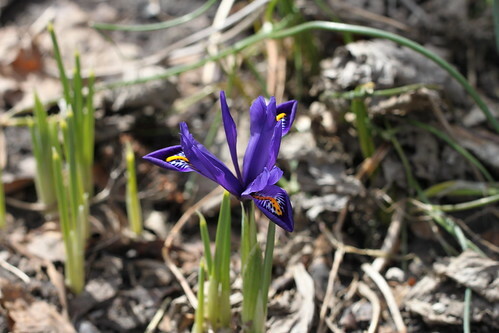 I just love iris reticulata - such an early bloomer - often through the snow.. intense blues and purple hues and very reliable.. thanks for sharing! Hope the salmon flowered peas do well for you. They have an unusual flowering habit, all the flowers come in a cluster at the top of the vine, about 4 or 5 feet high. I have planted your tomato seeds here, pleased to say the Pink Tie Dye tomatoes have germinated, making lovely big healthy seedlings! What a beautiful shade of blue. Or maybe it's part blue and purple. Whatever color it is, I like it. 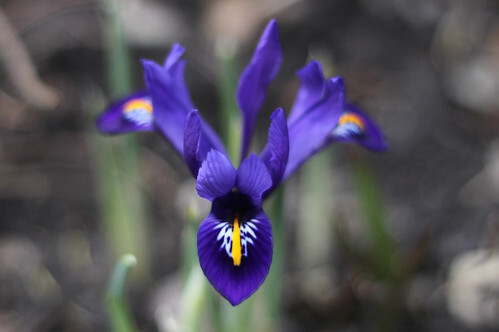 Thats a pretty good dark color on that iris, its what I really like about the viriginia irises or other dark purple irises.